The genius first year student who reads barefoot in the library, Kotomi often brings her own cushion to kneel on as well as food to eat. 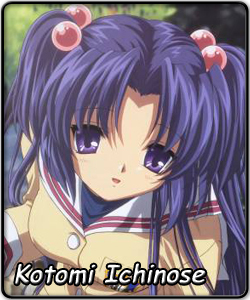 She refuses to respond to Tomoya Okazaki (male lead) unless he specifically called her "Kotomi-chan". She never attends class but always seems to ace tests. A concerned Tomoya helps her make some friends, giving her an example of how to introduce herself. Kotomi would "copy-paste spam" this to every stranger she sees, and it isn't so easy because she thinks people are being mean to her, especially people who aren't timid. Kotomi also likes playing the violin, and her friends set up a violin recital for her, despite the fact that humans (and domesticated animals) dislike her playing it. A lot. Kotomi was actually chosen among Nagisa Furukawa, Kyou Fujibayashi, and others to participate in advance by a handful of voters. After being tabbed by SOS-dan's Haruhi Suzumiya, Kotomi did very well in the preliminary stages here at the International Saimoe League, automatically locking herself in after the panel extended nominations for a second time in order to distinguish the seventeen remaining slots. Although Kotomi is timid here and tends to hide behind Kyou, it seems that she will be able to make a few friends, but she may also spur some rivalries, something she is afraid of. Still, she was given the opportunity to participate in Saimoe in advance, and she will give as much as she can as she looks to take the first ever International Saimoe tiara.